I am recipe testing for a magazine. Not my recipes. And when I may, I shall tell you more about them, and where to find them. For now, the neighbours are very happy (and the fridge is groaning with butter, eggs, cream cheese...). Half this cake went upstairs to Wolfgang, and the top floor girls will receive others for a birthday, tomorrow. Hey! My birthday is on Friday. We'll be in NYC that afternoon to celebrate and to visit the musician (the dandelion greens eater) who is playing Saturday night at the Mercury Lounge on Houston (http://rayabrassband.com/calendar/). Oh, and doesn't the wine intensify the chocolate flavor? Yum. 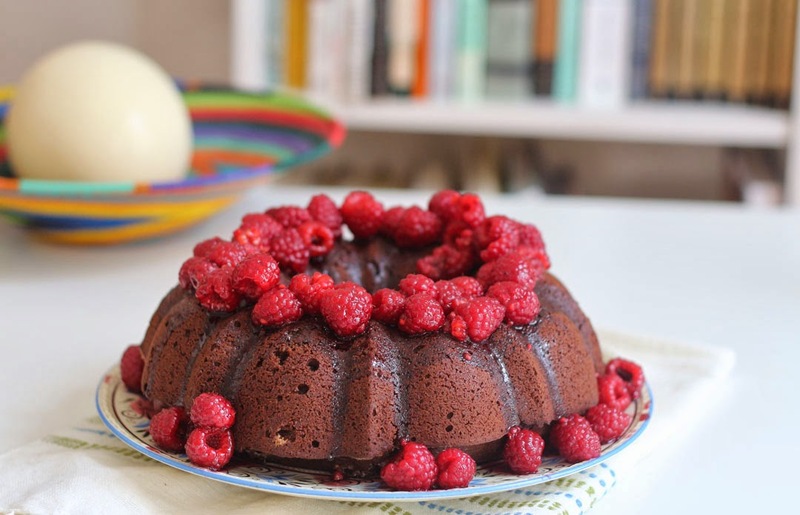 Oh, I bet that's yummy, chocolate, raspberries and red wine....sound like heaven in any form! In the immortal words of UB40, "Red Red wine makes me feel so fine." You're in the hood! Kind of. Tarrytown is a good foraging spot (well, its environs), and my lovely Edible Manhattan editor lives there. What light on yonder duck breasts breaks...?